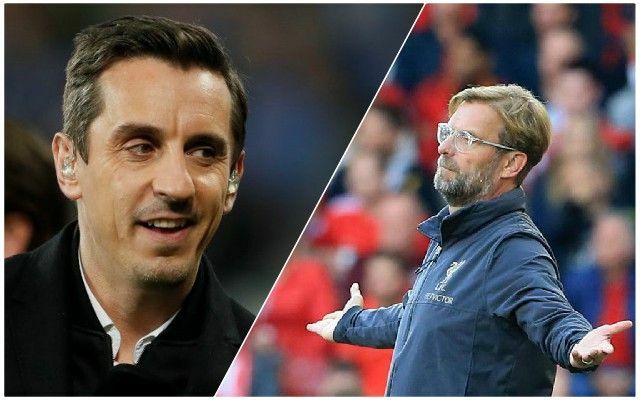 Gary Neville has tipped Liverpool to crumble under the pressure of the title race if it goes down to the wire – and has warned that a five-point gap to Manchester City is only a small one. Newcastle United did the Reds a huge favour on Tuesday night, before the 1-1 draw with Leicester City at Anfield on Wednesday, but Neville is still backing City to retain their Premier League crown. Despite there being no evidence of this Liverpool side feeling the pressure, Neville says he is still backing City because he feels Jurgen Klopp’s men are vulnerable. He added: “If City keep close within the last five games, I think they will win it. If it comes down to nerve in the last five games, City will win it. While Neville is right about nothing being won yet, and that a five-point gap is not decisive, suggesting that the Reds will fall under the pressure near the end is an interesting claim. Nothing so far suggests that it will happen – and it will be up to us to prove him wrong. We think his comments might be more out of hope that expectation!